Relatively modern but increasingly popular, the hybrid has become a vital part of many golfer’s armoury. Below we review some of the best hybrid golf clubs on the market. For the high handicapper, the hybrid has been a gift from the golfing gods. Created as an alternative for the difficult to hit low-numbered iron, the hybrid quickly became a favorite among pros and weekend warriors alike. Taking the utility and shape of a wood and combining it with the loft of a iron gives the golfer a club that is invaluable on the course. But why is the hybrid so popular? Mainly the hybrid succeeds due to its construction. Taking on the look of a shrunken wood, the hybrid is unique because the head of the club doesn’t have the volume of your typical driver. It is smaller and more shallow. But make no mistake the hybrid works because of the loft of the club. A hybrid’s loft will rival the iron it is replacing. For example, a 3-hybrid will carry the typical 19-degree loft that you would find on a 3-iron. So you take the loft, couple it with a compact head, and as a result you are left with a club that is far more forgiving to the off-center strike and far easier to swing with authority. Hybrids are perfect additions for the amateur looking to lower their scores. Their versatility can be utilized from either the tee box or the fairway. When choosing a hybrid, especially for the high handicapper, remember confidence is everything. You must believe the club you are using is perfect for the shot you need. And with advancements in technology, now you don’t have to buy three clubs when one adjustable hybrid will do. 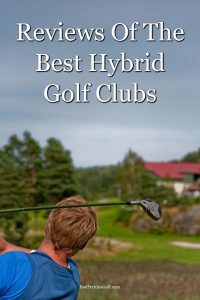 Now that you know what a hybrid is, the trick is in finding the perfect one for you and your game. So here are reviews of five of the best hybrid golf clubs for the money in 2017 to help you make an informed decision. First on the list is the TaylorMade M2 Rescure hybrid, the little brother to the very popular M1 Hybrid. The M2 has a few distinct differences from the M1. Most noticeably the M2 is set for those looking for a draw bias. For those unfamiliar with the phrase, a “draw bias” gives the club an offset face that encourages the right-to-left spin that will combat those dealing with a permanent slice. The M2 has a lower center of gravity, a feature very important for the amateur looking to get loft on drives and approach shots. When hitting balls most golfers notice a distinct sound from the M2 that certainly coincides with a well struck shot. This is a well constructed hybrid designed solely for high-handicappers looking to combat their slice. If that is you then the M2 is a welcome addition to your bag. The Callaway Steelhead XR is the most enjoyable hybrid to hit on this list. With an interesting design take on the hybrid, the Steelhead XR takes a typical hybrid club face and makes it shorter and taller. The smaller club head still packs a punch and there was no hybrid more rewarding on center strikes than the XR. But even on balls that sneak to the toe or heel, the Steelhead muscles through with ease, giving the golfer confidence with each swing. If there is a complaint about the XR it is “what-you-see-is-what-you-get.” There are no adjustable areas of the club. The loft and bias are fixed so picking out the right version is essential for the amateur. For those looking for the flexibility that the Steelhead XR hybrid doesn’t offer, but want a hybrid that stays in the Callaway family, then the Big Bertha OS hybrid is for you. One of the more high functioning hybrids on the market, the Big Bertha OS is versatile enough to give you a different loft and bias on the tee and then, as you sit in the fairway needing a draw, one quick adjustment puts that capability in your hand. More nimble than the XR hybrid, the Big Bertha OS encourages swing speed by forgiving those untimely bad shots and keeping you out of the trees. At contact, the Big Bertha OS provides solid and rewarding feedback that lets you know where the ball is leaving the club face. The Cobra King F7 hybrid is sleek, sound and a major success. With adjustable areas for loft and bias, the F7 gives the amateur a generous area to work within. In minutes, the hybrid gives you the ability to fine tune the flight path you want to take to the course that day. If you feel that the F7 is giving you too much height on your tee shots, then one crank of the wrench flattens out your shots. At address, the Cobra King F7 is beautifully constructed and alignment on the sweet spot is simple using the Cobra logo. When hitting balls, the F7 soars. Nothing on the list provided more consistent contact and repeatable flight like the Cobra King did. The Srixon Z H65 is a no-nonsense hybrid. You can’t adjust it and frankly it doesn’t have the distinct look, shape or feel that other popular hybrids carry. But don’t hold that against the club. Srixon has made a terrific hybrid that carries the heart and soul of what the hybrid is supposed to do. Out of the five hybrids listed here, none got the ball in the air like the Z H65 did. For some that may be an issue because loft could equal a loss of distance. But for the amateur looking to take advantage of what the hybrid can do to your game, the Srixon succeeds. What is most admirable about the Z H65 is how hard it works on shots that find the toe or heel. Most mis-hits with this hybrid will still fly straight, minimizing the damage to your score. The best hybrid golf clubs can make a big difference to your game and hence your scores, due to their more forgiving nature and ease of swing. Each of these hybrids reviewed here would be a welcome addition to any golf bag.